The new Hayden Sphere, which weighs 4 million pounds and measures 87 feet in diameter, is the largest and most powerful virtual reality simulator in the world. Before entering the upper hemisphere wherePassport to the Universe is shown, beautifully rendered videos offer some basic astronomical information. Once inside, a Zeiss Mark IX Star Projector and the Digital Dome System fly you through the biggest data-based model of the universe ever projected. As if there weren’t enough stars involved, the center’s two shows are narrated by Academy Award winners Tom Hanks and Jodie Foster. The Space Theater can take 429 people at once on a breathtaking tour of the known universe, rendered as accurately as possible with data from such sources as NASA’s Jet Propulsion Laboratories and Hubble Space Telescope. You will be flown through our galaxy, exploring the neighboring planets and watching as a traditional two dimensional constellation is rendered in three dimensions, one star in Orion’s belt trailing behind us, one fast approaching ahead. The show even affords a shortcut home, via a free fall headlong through a black hole. The technology behind the show allows museum experts to weave together data sets from many separate sources, creating unique, three-dimensional digital maps of our galaxy. 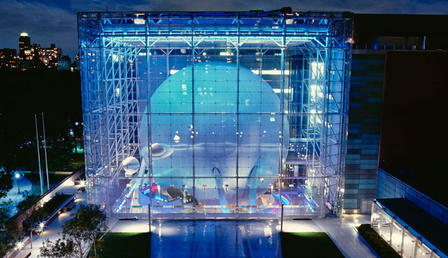 The Center houses the most sophisticated space projector in the world, the Zeiss Mark IX, and the Digital Dome System, consisting of the latest SGI Onyx 2 computer and a Trimension video display with 7 coordinated Barco 12 foot Cathode Ray Tube high resolution video projectors. As James Sweitzer explains it, “no one, not even astronomers, has ever been able to experience the universe in this way or on such a vast range of scale. For the first time, we can travel through a real, continuous scientific model of the universe “. As you leave the Big Bang theater, you will begin a spiraling journey that documents the evolution of the universe. The Harriet and Robert Heilbrunn Cosmic Pathway is a gently sloping walkway which squeezes 13 billion years of cosmic evolution into the length of a football field, about 3 million years per inch. Visitors of all ages can measure how many years a single stride encompasses. Along the way, a photographic record of our cosmic history unfolds; we see these astronomical objects not as they are now, but as they were billions of years ago when their light first began it’s journey towards Earth. The first few panels have been left blank in anticipation of future discoveries dating back even earlier. Subway Entrance (Lower Level): Every day from 10 a.m. – 5:45 p.m.
Every day from 10 a.m. – 5:45 p.m. The 77th St. Entrance (between C.P.W. and Columbus Ave.) is not currently open to the public. The 77th St. Entrance is open for special events and education programs only. The Weston Pavilion Entrance (Columbus Ave. and 79th St.) will be open both weekdays and weekends from July 1 through Labor Day. For evening programs and lectures, please refer to your ticket for specific entrance information. In addition you may enter the Security entrance which is under the main stairs on Central Park West. A staff member will be there to inform you of the location of your program or lecture. If you are traveling from north of New York City, please visit the Metro-North Railroad Web site for convenient maps and schedule information. If you are traveling from Long Island, please visit the Long Island Railroad Web site for convenient maps and schedule information. If you are traveling from New Jersey, please visit the New Jersey Transit Web site for convenient maps and schedule information. If you are traveling from outside the New York City Metro Area, please visit the Amtrak Web site for route and schedule information and to purchase tickets.